My upright European Hornbeam, again wired and styled by a friend. 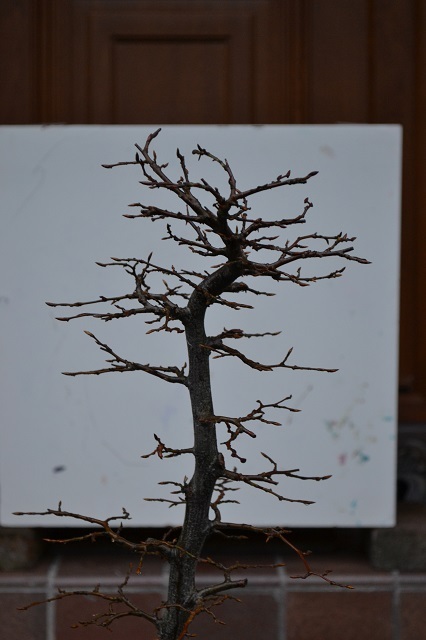 Last year it was air layered at the top and a thread graft performed lower down to provide a new branch .Both techniques worked and this year it has been left alone.The picture on the left was taken in March. 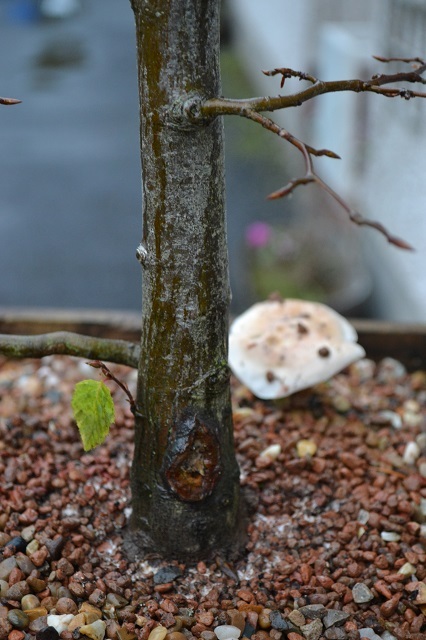 The trunk was chopped further recently and hopefully this will promote adventitious buds in the spring. Leave the thread graft to thicken before removing in the autumn. Fertilise well to increase new branch girth. Defoliate selected branches in the summer. All the leaves have finally dropped on this hornbeam which was growing in a flower bed for the past three or four years. 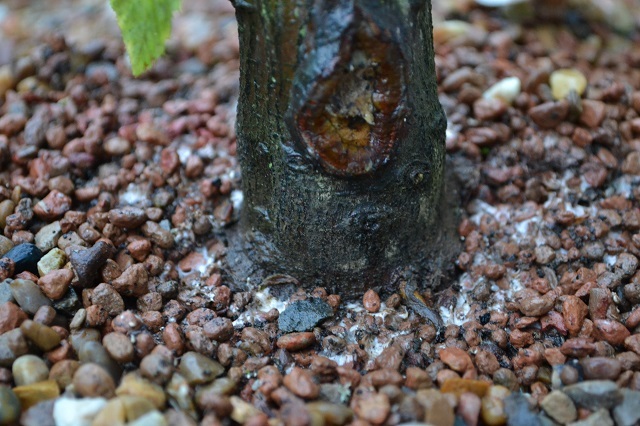 It initially had a poor root system so I placed a tourniquet at the base of the tree at the beginning of 2013 and fed it like mad. It was worked on while in the flower bed to promote good trunk taper. At the start of this year I inspected the new roots that were produced and decided to lift the tree at the same time. The thick tap root was cut back some and it was planted in this training box. 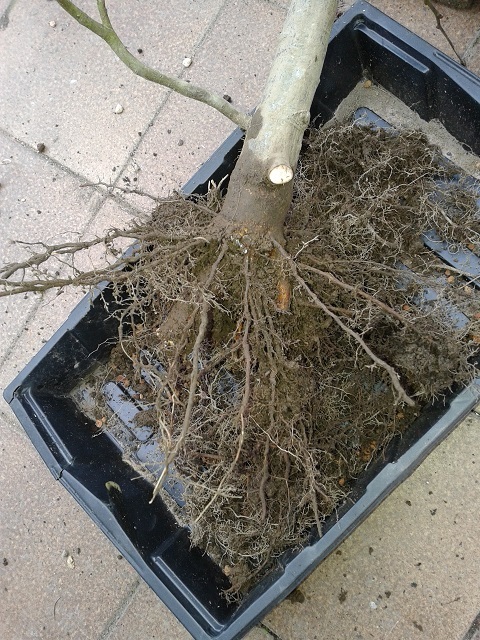 The tree has been untouched this year as it’s been recovering from losing a significant bit of its original root mass. I decided it was now time to tidy up a few old pruning wounds from last year. The base of the tree has flared out a little and by allowing unlimited root run over the next few years, hopefully this will increase. Fungi has made an appearance in the box but I assume this isn’t harmful? Please correct me if I’m wrong! 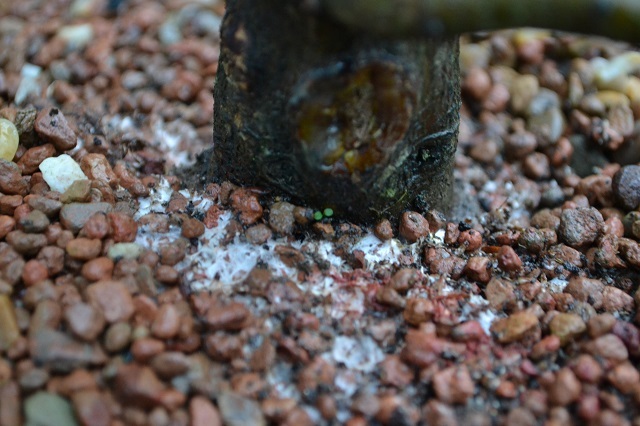 I scratched away at the top layer of grit to inspect the nebari but found the growing medium thick with fungi – I hope it’s the beneficial stuff. I love the formal, gradual, taper of this tree but I’m starting to think that it’s too tall and that if the top was air layered, it would make a great wee shohin tree. 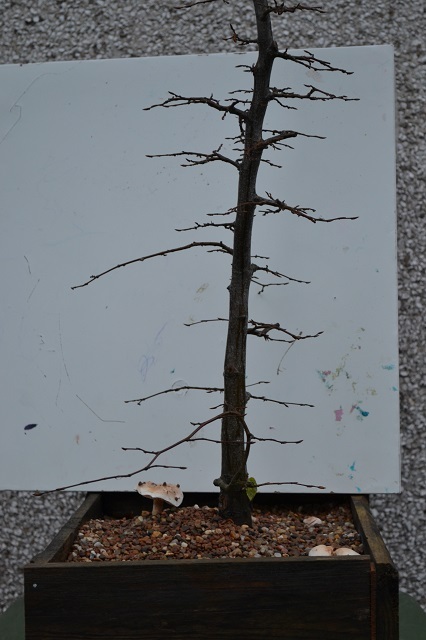 The remainder of the tree would look more mature too but still needs thickening. So I have the possibility of two promising trees from this piece of material. I haven’t decided yet. It’ll be protected this winter and then next year allow more free growth. Health permitting, it could be ready for work again next autumn. 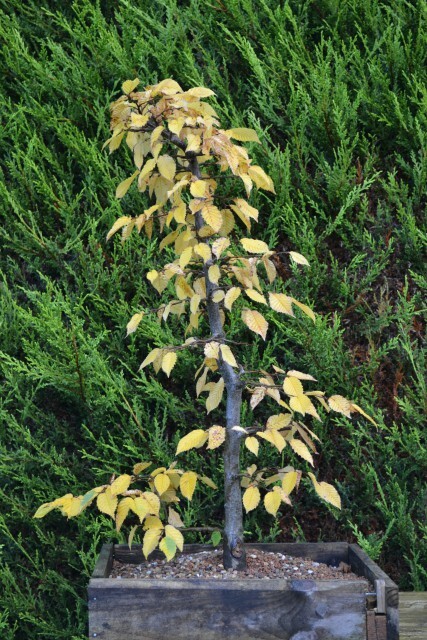 European hornbeam (Carpinus Betulus) grown from a young whip bought in a hedging bundle four years ago. 3 years in the flower bed, with a tourniquet on for last 18 months to growth a new nebari. Lifted earlier this year and left untouched in the training box to recover. Great colour. No plans for styling yet.